LISTEN TO A TEASER FEATURING EXCERPTS AND NON-ALBUM MOMENTS! VIEW OUR BOOK ANDY KAUFMAN, I HATE YOUR GUTS! When news broke near to Andy Kaufman’s birthday that an album of unreleased material was going to be released by Drag City/Process Media on July 16th, the word spread like wildfire. Everyone from The New York Times to The AV Club to Pitchfork to Paste covered the news with the excitement of an unhinged Latka Gravas. It’s no small coincidence that a flurry of new rumors concerning Andy being alive and well and living in ambiguity in Albuquerque, New Mexico surfaced shortly thereafter. These things happen every few years accompanying the release of any new Andy-related news. We will neither confirm nor deny any such claims (if we were ever in any place to comment on them in the first place). However, we are very excited to share a snippet of audio from the 82 hours of micro-cassette recordings Andy made between 1977-79. This sneak peek, premiered on Dangerous Minds, features moments both on the record and off, created by Vernon Chatman (Wonder Showzen, South Park, Louie, The Chris Rock Show) the same mastermind behind the creation of the whole record (along with the help of editor Rodney Ascher, director of acclaimed documentary Room 237). With liner notes by Kaufman co-conspirator Bob Zmuda, and narration by Saturday Night Live’s Bill Hader, Andy And His Grandmother, out July 16th on Drag City/Process Media, promises to be a true work of comedy for our times – one that was performed over thirty years ago. Andy Kaufman changed the worlds of comedy and performance in the 1970s, showing fans and friends alike a determination to follow put-ons into territory no one had ever even considered “comic” before. His fervor was so intense that when he passed away suddenly in 1984, it seemed as if the ultimate disappearing act had been staged; one that some people believe is still ongoing, with the reveal soon to come. This makes him the quintessential entertainer of our generation, a man ahead of his time and ours, and a force that has yet to be matched—even in the mega-saturated media world of the 21st century. Among the many things that Andy achieved in his lifetime (and in the years following), a phonograph album release, the staple of stand-up comedians in his time, never happened—until now. Andy and His Grandmother is material never heard before, a skimming from 82 hours of micro-cassette tapes that Andy recorded during 1977– 79. Andy regarded the micro-tape recorder as a fantastic new way of capturing his hoaxing, and carried it with him everywhere, for use at any given moment. Real life was the ultimate frontier for him, and these tapes demonstrate the heart of Andy’s comedy. With gusto, he involves those closest to him, as well as total strangers, in put-ons, falsehoods and other provocations, pushing the limit on logic and emotional investment in everyday situations from the trivial to the deeply personal until any suspension of disbelief is out of the question for all involved, and everyone becomes fully immersed in whatever scenario Andy is suggesting as the new reality. With so much material on hand, we turned to a writer, producer and comedian whose resume indicated to us that he was a true child of Kaufman’s twisted talent. Since the late 90s, Vernon Chatman‘s work has been experienced by television viewers and aficionados ofSouth Park, Wonder Showzen, Xavier: Renegade Angel, The Heart She Holler, and Doggie Fizzle Televizzle, as well as fans of the Drag City DVD release Final Flesh. Vernon dug deeply into the tapes, coming up with a concept for a single LP that would include several dozen excerpts. Slowly and carefully, the final sequence was shaped. Along the way, Vernon produced several tracks, adding effects to pieces that were clearly unfinished (in particular, “Sleep Comedy”) and drafting SNL‘s Bill Hader to provide narration for the jour- ney. The finished album, with liner notes from Vernon and Kaufman cohort Bob Zmuda, is a work of comedy for our times—one that was performed over thirty years ago. 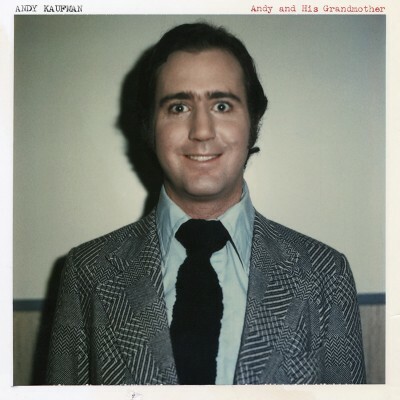 Perhaps the best thing about Andy And His Grandmother is that it extends the body of work that Andy Kaufman pursued relentlessly between 1971 and 1984 with “routines” never before seen or heard in any of his known performances. This is no recap or greatest hits collection derived from material meant to be seen as well as heard. Andy created these tapes to format his incredible approach on a purely sonic level. The funny to be found in the unfunny, the comedy of everyday existence, the comedy of tragedy, these things are the legacy of Andy Kaufman—and all are vividly on display throughout Andy and His Grandmother.